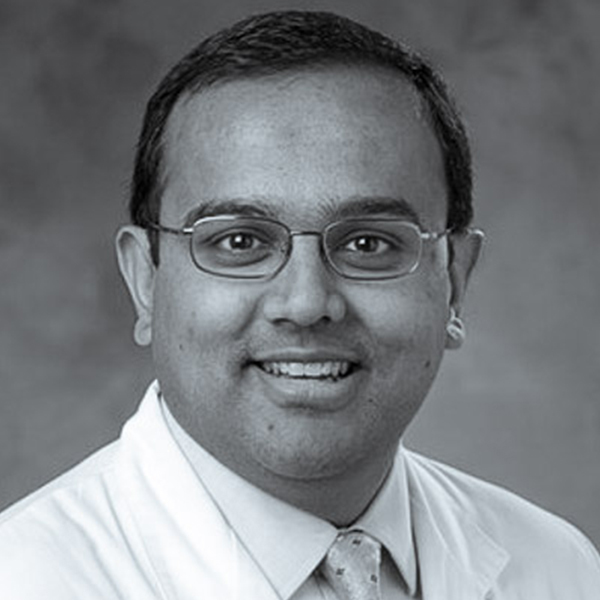 Manesh R. Patel, MD, Chief of the Division of Cardiology for Duke's Department of Medicine, is an associate professor of medicine, a member of the Duke Clinical Research Institute, and director of Interventional Cardiology and Cardiac Catheterization Labs across the Duke University Health System. His clinical interests include diagnostic and interventional coronary angiography, peripheral angiography, and endovascular intervention. He is involved in several clinical trials involving patients with cardiovascular disease and in cardiac imaging. Manesh is the chair of the American College of Cardiology Task Force for Appropriate Use Criteria for Cardiovascular Procedures, and is chair of the American Heart Association Diagnostic and Interventional Cath Committee. His interest in cardiac imaging, quality of care, and cardiac devices is evident in his research. His integration of these efforts into his roles at Duke was recognized in 2010 when he received the prestigious Duke Cardiology Fellowship Mentor Award. In 2011, he was named the endowed John Bush Simpson Assistant Professor of Cardiology, and on 2013, he received the Robert M. Califf Faculty Clinical Research Award. Manesh received his M.D. from Emory University, then came to Duke for residency, served as chief resident in medicine, and completed fellowship in cardiology. He joined the faculty in 2006.